Yeah, it took me awhile to read this, but not because I didn't want to. I just wasn't able to get my hands on it. Anyway, I read this on the plane, and boy, it helped make my journey enjoyable. The only reason I DON'T recommend reading this on a flight is because you'll try not to cry. 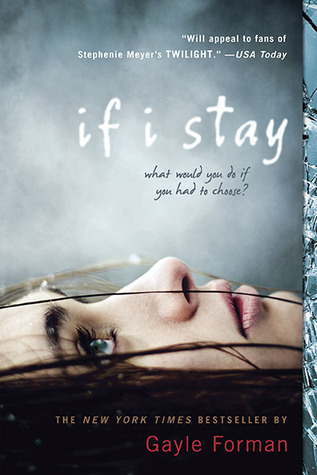 If I Stay is a truly a story of breathtaking beauty. The un-romanticized pieces of real-life awkwardness, passion, family and friends make this story real and ironically, romantic. It paints a picture of life ended so abruptly its hits home hard, making it a must read. The plot is unique in that it's told over the course of one day: what Mia's seeing now peppered with memories of her life. It's a brilliant strategy- it allows you to experience the tragedy at first in a detached way, like you would if you heard about it in the news. And then, slowly at first but then faster, you began to live and love these people- feel their pain as what happened to them impacts you only after the fact. The characters are simple people who are endlessly complex. That's a complicated way of saying REAL. The cover is stunning. Looking forward to catching this movie sometime soon. Great review. I love this book, although it made me cry so much so I can't believe how hard it would be to read it on a plane. I'd probably cry loads and embarrass myself... A LOT!